Yahoo announced the latest in a series of enhancements to its results pages for media and celebrity related searches today, hoping to staunch the steady bleeding of its search traffic. Search results for actors and actresses, movies, and television shows now feature images, videos, and links to related media and celebrities. All of the major search engines have been making improvements like these to make results pages more than just a bare list of links. The idea is to serve up the content people are looking for right on the results page. So far, the most striking example of this has been in music. Google (GOOG), Microsoft’s Bing, and Yahoo (YHOO) all let you stream music directly from the results of searches for popular artists and songs. 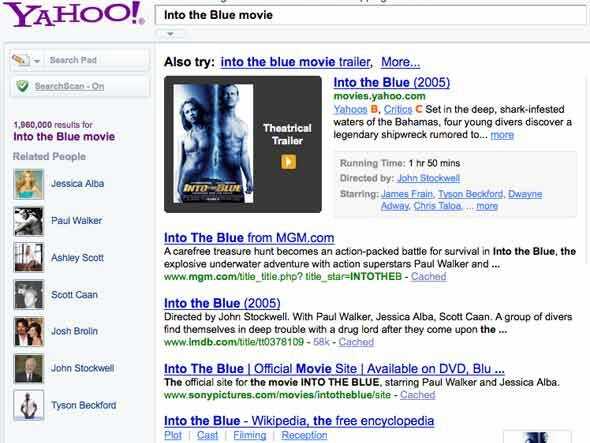 But this latest rollout from Yahoo is definitely a step beyond what its competitors are offering. Of course, if it proves popular, Google and Bing will be doing it sometime next week. And people still won’t use Yahoo. features media online sai-us search yahoo!